...and place adhesive side down on your shirt. you are the most awesomest mom! i love that the instruction is all done in the disney font, too. very cute. and crafty. and inexpensive. rock star mom, you are! So cute. You are going to get so many compliments and comments about those shirts! I. love. this. Your boys will be the cutest kids at Disney, Kelli! I love the way you used the spray adhesive before sewing...what an awesome way to get around using the expensive fabric transfer material stuff. Great job!!! Soooo cute! You are so creative! I hope you and your family have a great time at Disney World. Kelli I am loving all of your Disney ideas! I really hope we get a chance to go sometime! These shirts are so cute and I love that their names look like Disney writing! They are perfect and I can't wait to see your pics from your trip! I do wish I lived closer so I could come and sit with you while you do these things to learn. I love the picture tutorial...that's the next best thing. These shirts turned out really well. Your model is so handsome! I can't believe you have a Disney font! Wait- yes I do. Of course you do! Your boys seem to have everything they need for the trip! Oh- and I am LOVING Eli's pose! So funny and so cute. He is losing his baby look though, make that stop. Yall are going to look so cute!!! Super fun idea. You're so awesome! I have GOT to learn how to sew! I want one too!! :-) If I had a sewing machine I'd make me and the girls these shirts...right now! I love this! 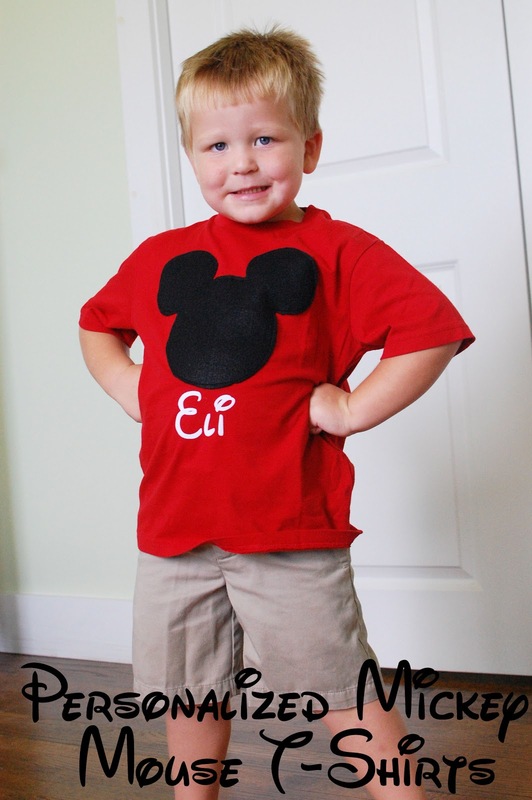 I did a Minnie tank for my little one (minniemousebirthday.blogspot.com), and I adore this Mickey shirt! 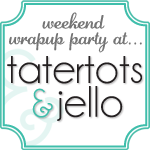 We are still having our Crafts for Under Twenty Somethings party through noon tomorrow if you would like to link your awesome post!! Super cute! I hope you're having a great time! I Love Disney...so thank you for sharing all of your cute ideas! Thanks for the template. Another question: how did you get the letters on the heat transfer? my mom has a cricut that I could use, but I don't know how I would do it with the heat transfer. Thanks for your help! I'll have to email you pictures once I get it finished! Could you please send me the template? Also, it there any way that I could get you to allow me to purchase iron ons from you in my daughter's names? I don't have a either of the machines to make them & would LOVE to have their names on them. I love the shirts! My question is: How does the felt hold up with washing? I love your shirts!!! Would you mind sharing the mickey template with me? Also could I pay you to make my sons name for the shirt? I I can't get the font to cut. I also have a Henry. He is 2. If you ever have any personalized items for Henry you would want to sell or pass down, I would love to look at them! Would you mind sharing where you found your mickey template, please? I'm making some tees for my kids first trip to Disney next week! Thank you! Can I get the template too please? I love your shirts and would like to make some for my grandkids. How can we get the template? Adorable and easy! How can I get a copy of the template? Love this shirts! You are so creative. We are going to WDW for Christmas and I would like to do this shirts for everybody (12). My question is does cricut work with the heat transfer? and how would you do this? These are so cute and will perfect for our Disneyland trip coming up. Could I get the Mickey Template? Can you please email me the template? Thank you in advance. Can you please e-mail the template to me? We are going to Disney really soon. Thanks in advance. Would you please email the template?? I found your blog while looking around on pinterest & LOVED the idea!! THANK YOU!! Can you please email the template as well?? I LOVE this idea!! Hey. Can you please explain how to use the heat transfer with the silhouette? I didn't understand the instructions for that part. Thanks! Hey can you please explain how to use the iron on transfer with the silhouette? I didn't understand the instructions for that part. Thanks! I love these shirts! I would make them, but I can't even sew a button on! Do you sell them?? We are going to Disney in five weeks, and I would love to have them for my three little ones! Awesome job! Is it possible to get the mickey head template please? I would love to make this shirt for my daughter and all her cousins for there 1st Disneyland trip in May :) Thanks for showing this great diy project! I love you shirts! We are going in july and I would love to make these for my 2 kiddo's. I see alot are asking for the template can I also ask for one? Also were do u find that writing? I am, a lil confused on that. Thanks! I adore your t-shirts! Can you please email me the mickey template: tkuhn0217@gmail.com? Also, did you leave the paper template on the felt when you sewed it on the shirt? Clearly I'm not crafty but going to try! Love your shirts- going to try and make them for my kids. Do I leave the paper behind the felt when I sew it onto the shirts? These shirts are awesome!!!! Are you interested in making 6 shirts for our upcoming trip? If not, would you mind sending me the mickey template? My email address is: christine.stein@rocketmail.com.